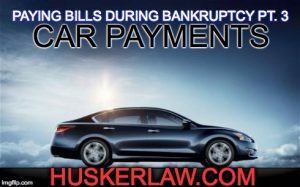 In bankruptcy, whether or not you continue to make your car payments is actually very complicated and specific to your situation. We recommend that you read this blog as well as our Chapter 7 Bankruptcy: What Will Happen to My Car blog, if you have filed a Chapter 7 bankruptcy. If you are in a Chapter 13 bankruptcy, then your car payments will most likely be paid through your plan payment. This is typically the case. However, it is important to know if this is indeed the case or not. If you do not know whether or not your car payments are included in your plan, you should contact your attorney to confirm whether or not they are indeed included. It will be stated in your filed plan; however, Chapter 13 plans can sometimes we confusing to understand. If you want to keep your car and reaffirm the debt owed to your car lender, you should keep up on these payments throughout your bankruptcy. Now as with mortgagors, auto lenders do not always make this an easy process because of the Automatic Stay. Without having a signed reaffirmation agreement on file, your auto lender may restrict your online access or even “freeze” your account. This can create a lot of red tape for you to get through, just to make a car payment. It is our procedure to have you sign your reaffirmation agreements at the time of your hearing. In the meantime, you should still keep up on these payments. If your intention is to keep your car and continue making the monthly payments, those payments will remain due and owing each and every month, per the terms of your car loan agreement.